The 2018 All-Northwest District football teams have been announced. The below listed student athletes were selected by a media panel from the district. Ends– Isaiah Alsip, Galion, 6-1, 175, jr.; Jayden Cornell, Kenton, 6-3, 195, so. ; Uriah Schwemley, Shelby, 6-3, 200, sr.
Linemen– Mitch Seewar, St. Marys Memorial, 6-1, 230, sr.; Ian Young, St. Marys Memorial, 5-10, 200, sr.; Morgan Mallory, Port Clinton, 6-3, 320, sr.; Hunter Tollison, Bellville Clear Fork, 6-2, 295, sr.; Nick Amstutz, Shelby, 6-4, 285, sr.
Running backs– Trevon Trammell, Bellville Clear Fork, 6-0, 185, sr.; Nate Place, Van Wert, 6-2, 185, sr.
Quarterbacks– Elias Middleton, Galion, 6-0, 165, sr.; Jaron Sharp, Kenton, 6-3, 200, sr.
Kicker-Gabe Vandever, St. Marys Memorial, 5-11, 175, sr.
Linemen– Blake Kanorr, St. Marys Memorial, 6-4, 265, jr.; Michael Chillemi, Bellville Clear Fork, 6-2, 260, sr.; Mitchell Pittman, Ontario, 5-9, 185, sr.; Trevor Rodriguez, Wauseon, 6-2, 230, sr.; Keagon Hammons, Van Wert, 6-0, 190, jr.; Alex Kuhl, Huron, 6-0, 260, sr.
Linebackers– Eddie Fowler, St. Marys Memorial, 5-10, 170, sr.; Noah Creed, Ontario, 5-11, 185, sr.; Angel Granados, Napoleon, 5-7, 154, sr.; Jack Howey, Bellevue, 6-1, 195, jr. 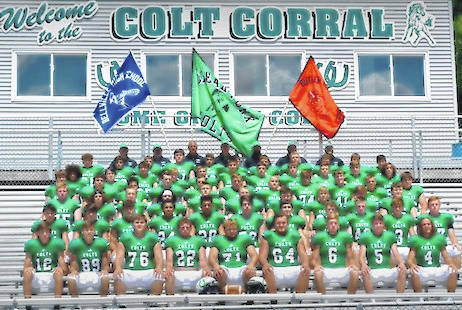 Defensive backs– Sean Perry, St. Marys Memorial, 5-10, 180, sr.; Carter Ballweg, St. Marys Memorial, 6-1, 175, sr.; Jared Schaefer, Bellville Clear Fork, 6-2, 190, sr.; Casey Scroggins, Huron, 5-11, 165, sr.
Linemen– Nick Myers, St. Marys Memorial, 5-11, 265, sr.; James Watt, Bellville Clear Fork, 6-0, 250, sr.; Cody Butler, Napoleon, 5-11, 258, sr.
Quarterbacks- McGwire Albert, Shelby, 6-5, 200, jr.; Nate Miller, Bryan, 6-1, 193, jr.
Kicker–Gabe Baluser, Bellville Clear Fork, 6-0, 165, jr.
Linemen– Braden Weitholter, St. Marys Memorial, 6-4, 260, sr.; Gunar Zink, Port Clinton, 6-4, 215, sr.; Jay Swainhart, Bellville Clear Fork, 5-10, 195, sr.; Matt Herold, Bryan, 6-3, 190, sr.; Joey Schaufelberger, Van Wert, 6-5, 230, sr.; Noah Eikenbary, Kenton, 6-0, 220, jr. Honorable mention: Brennan South, Bellville Clear Fork; Kyle Rettig, Napoleon; Drew Bagley, Van Wert; Austin Moore, Kenton; Colton Ray, Bellevue; Jason Taylor, St. Marys Memorial; Owen Hatfield, Ontario; Logan Hissong, Ontario; Tate Rubenstein, Napoleon; Isaac Wilson, Wauseon; Miguel Gomez, Wauseon; Damion Hay, Bellevue; Carson Ehrhardt, Milan Edison; Jared Tomson, Milan Edison; Jonah Pfeil, Vermilion; Davis McDaniel, Vermilion; Connor Arthur, Bryan; Brycen Andrews, Bryan. Ends- Cam Reynolds, Rossford, 6-5, 195, jr.; Austin Meier, Tontogany Ostego, 6-3, 179, sr.; Harry Jackson, Millbury Lake, 5-10, 185, sr. Tight end- Nate Lewis, Genoa, 6-2, 190, sr.
Linemen- C.J. Johnson, Liberty Center, 6-1, 260, sr.; C.J. Spradlin, Liberty Center, 5-11, 225, sr.; Joe Muetze, Millbury Lake, 6-3, 270, sr.; Cole Heffernan, Oak Harbor, 6-1, 255, sr.; Reid Buchman, Pemberville Eastwood, 5-11, 192, sr.; Brent Deyarmond, Rossford, 6-4, 250, sr.
Running backs- Jaden Rayford, Pemberville Eastwood, 6-1, 295, jr.; Scott Mackiewicz, Millbury Lake, 5-10, 170, jr.; Daniel Novotney, Genoa, 6-0, 240, jr.; Caleb Carpenter, Libery Center, 6-2, 215, sr.
Quarterbacks- Mitchell Downs, Tontogany Otsego, 5-11, 185, sr.; Jacob Plantz, Genoa, 6-3, 200, sr.
Kicker- Orry Killam, Liberty Center, 5-11, 150, sr.
Linemen- Kasyn Schaffner, Archbold, 6-1, 180, sr.; Cole Roob, Oak Harbor, 5-11, 270, sr.; Cole Steele, Tontogany Otsego, 5-8, 190, sr.; Damion Allison, Millbury Lake, 6-0, 255, sr.; Zach Mahl, Willard, 6-0, 225, sr.
Linebackers- Luke Walsh, Millbury Lake, 6-2, 205, sr.; Maguire Volkmar, Liberty Center, 5-11, 155, jr.; Clay Schulte, Oak Harbor, 5-11, 170, jr.; Andrew Bench, Genoa, 6-5, 215, sr. Defensive backs- Austin Like, Liberty Center, 5-11, 185, sr.; Tyler Safran, Millbury Lake, 5-9, 145, so. ; Hunter Wilkins, Oak Harbor, 5-10, 175, sr.
Punter- Sam Witt, Genoa, 5-10, 185, jr. Offensive Players of the Year- Jacob Plantz, Genoa. Lineman of the Year- CJ Johnson, Liberty Center; Damion Allison, Millbury Lake. Coach of the Year- Paul Patterson, Genoa. Ends– Hunter Kesler, Paulding, 6-2, 165, sr.; Brevon Polachek, Willard, 5-10, 155, sr.; Harley Robinson, Bucyrus, 6-1, 165, sr.
Linemen– Matthew Gladieux, Archbold, 6-1, 225, jr.; Brendan Zink, Millbury Lake, 5-7, 220, jr.; Logan Clark, Ottawa-Glandorf, 6-4, 235, sr.; Kaleb Snodgrass, Van Buren, 6-3, 230, jr.; Micah Graves, Bucyrus, 6-0, 225, soph. Running back- Maalik Tucker, Fostoria, 5-8 160 sr.; Zach Bowers, Liberty Center, 6-2, 215, sr.; Justin Pickerel, Pemberville Eastwood, 5-10, 175, jr.
Quarterbacks- Cooper Parrott, Willard, 6-3, 190, jr.; Jac Alexander, Oak Harbor, 5-10, 180, jr.
Kicker- Thomas Piccirillo, Van Buren, 5-10, 165, sr.
Linemen- Hunter Dotson, Millbury Lake, 6-1, 255, sr.; Logan Hoffman, Ottawa-Glandorf, 6-3, 330, sr.; Ron Koehnke, Van Buren, 6-1, 190, sr.; David Maassel, Liberty Center, 5-10, 200, sr.; Sanford Fraley, Bloomdale Elmwood, 5-9, 192, jr.
Linebackers– Dylan Tippe, Ottawa-Glandorf, 5-10, 170, sr.; Andrew Pifer, Bucyrus, 5-10, 180, jr.; Ryan Harroun, Tontogany Otsego, 6-2, 187, sr.; Zach Kwiatkowski, Pemberville Eastwood, 5-6, 152, soph. Defensive backs- Elijah Zimmerman, Archbold, 6-1, 175, jr.; Will Kaufman, Ottawa-Glandorf, 6-0, 175, soph. Honorable mention: Anthony Cruz, Archbold; Jarrod Beach, Ottawa-Glandorf; Garrett Wright, Bloomdale Elmwood; Dawson Delventhal, Millbury Lake; Jacob Romine, Liberty Center; Noah Gomez, Archbold; Tony Grime, Archbold; Joey Holida, Willard, Jerett Sowers, Willard; Tyler May, Oak Harbor; Austin Martikan, Oak Harbor; Jordan Arnold, Oak Harbor; Brady Rader, Van Buren; Blake Jones, Van Buren; Nate McMillan, Upper Sandusky; Diago Cazares, Upper Sandusky; Garrett Wright, Bloomdale Elmwood. Ends- Caleb Frank, Sherwood Fairview, 6-1, 165, soph. ; Nick Tangeman, Maria Stein Marion Local, 6-4, 175, sr.; Cole Frilling, Coldwater, 6-4, 175, sr.; Cole Fletcher, Harrod Allen East, 6-2, 195, jr.; Paul Latz, Oregon Cardinal Stretch, 5-8, 151, sr.
Linemen– Payton Lange, St. Henry, 6-3, 220, sr.; Reece Eifert, Maria Stein Marion Local, 5-10, 200, sr.; Ethan Truex, Lima Central Catholic, 5-10, 275, jr.; Jacob Maley, North Robinson Colonel Crawford, 6-4, 260, sr.; Jacob Boes, Carey, 6-0, 270, sr.; Dave Chappell, Toledo Northwood, 6-0, 201, sr.
Running backs– Payton Pease, Montpelier, 5-10, 155, sr.; Zach Niekamp, St. Henry, 6-1, 195, sr.; Blaine Swartzmiller, Attica Seneca East, 6-3, 225, sr.; Cannan Johnson, Spencerville, 5-8, 150, sr.
Quarterbacks- Cade Polter, Sherwood Fairview, 6-0, 160, jr.; Nathan Bruns, Maria Stein Marion Local, 6-6, 195, sr.; Jake Hemmelgarn, Coldwater, 5-11, 150, jr.
Kicker- Blake Dippold, Coldwater, 5-9, 190, jr.
Linemen– Brian Merritt, Haviland Wayne Trace, 5-10, 245, sr.; Micah Pearson, Lima Central Catholic, 6-2, 201, sr.; Cody Johnson, Columbus Grove, 6-4, 380, sr.; Gavin Leffler, Bucyrus Wynford, 6-2, 245, jr.; Tyler Turek, Attica Seneca East, 6-6, 230, sr.; Adam Hackworth, Carey, 6-1, 210, sr.
Linebackers– Chayse Singer, Sherwood Fairview, 5-9, 185, jr.; Sam Huelsman, Maria Stein Marion Local, 6-4, 230, sr.; Mitch Niekamp, Coldwater, 5-10, 180, sr.; Eli Yahl, Spencerville, 6-2, 225, jr.; Brady Hauenstein, Columbus Grove, 6-3, 200, sr.; Jonah Studer, North Robinson Colonel Crawford, 6-0, 215, sr. Defensive backs– Matt Rethman, Maria Stein Marion Local, 5-11, 155, sr.; Kale Lee, Spencerville, 5-9, 160, sr.; Caleb Barrientes, Columbus Grove, 5-11, 170, sr.; Seth Benedict, Bucyrus Wynford, 5-10, 155, jr.; Addison Weaver, Gibsonburg, 6-4, 191, sr.
Punter- Hunter Tresman-Reighard, Delta, 6-4, 215, jr.; Brandon Fleck, Maria Stein Marion Local, 5-11, 185, jr.
Ends– Chandler Lumbreezer, Metamora Evergreen, 6-2, 185, sr.; Jordan Fenner, North Robinson Colonel Crawford, 6-0, 150, jr.; Griffin Summit, Carey, 6-1, 175, sr.; James Weaver, Castalia Margaretta, 6-0, 165, sr.
Linemen- Devin Siefring, St. Henry, 5-10, 195, sr.; Jack Knapke, Fort Recovery, 6-4, 250, sr.; Derek Wilker, Maria Stein Marion Local, 6-3, 215, sr.; Caleb Heider, Lima Central Catholic, 5-10, 195, jr.; Zach Collum, Kansas Lakota, 5-11, 260, sr.
Running backs- Nolan Habodasz, Maria Stein Marion Local, 5-11, 175, sr.; Joel Lotz, Spencerville, 5-8, 160, sr.; Shaun Thomas, Lima Central Catholic, 6-0, 170, soph. ; Trevor Franks, Kansas Lakota, 5-7, 155, jr.
Quarterbacks- Chase Foos, Attica Seneca East, 6-0, 205, jr.; Nick Leibacher, Castalia Margaretta, 6-0, 170, sr.; Jay Moten, Northwood, 6-1, 155, soph. Kicker- Rece Verhoff, Columbus Grove, 5-4, 105, fr. Linemen- Zac Brickel, Hicksville, 6-0, 175, sr.; Darrin Hays, Maria Stein Marion Local, 5-8, 180, sr.; Tom Catlin, Spencerville, 5-10, 160, sr.; Shane Overly, Lima Perry, 6-0, 195, sr.; Jake Foster, Gibsonburg, 6-3, 212, jr.; Donte Dixon, Northwood, 6-0, 236, sr.; Nate Kohlhofer, Delta, 6-2, 250, sr.
Linebackers– Kyle Ordway, Defiance Tinora, 6-0, 200, sr.; Ben Wenning, Coldwater, 5-10, 180, sr.; Nylan Cannon, Lima Perry, 6-4, 200, sr.; Jordan Clauss, Carey, 6-0, 190, sr., Hunter Smith, Gibsonburg, 5-11, 200, jr.; AJ Rable, Northwood, 5-9, 202, soph. Punter- Brycetyn Hedden, Castalia Margaretta, 6-0, 210, jr.; Garret Bartel, Findlay Liberty-Benton, 5-11, 177, sr. Honorable mention: Tallen Kennedy, Kennedy, Castilia Margaretta; Gavin Thobe, Fort Recovery; Owin Severs, North Robinson Colonel Crawford; Payton Chance, North Robinson Colonel Crawford; Brad Mendoza, Gibsonburg; Garrett Nemire, Columbus Grove; Trevor Taylor, Columbus Grove; Eric Schlarman, Maria Stein Marion Local; Nate Showalter, Haviland Wayne Trace; Ethan Halker, Columbus Grove; Austin Campbell, Lima Central Catholic; T.J. McAvene, Ashland Crestview; Jordan Dasher, Carey; Hunter Vanwert, Metamora Evergreen; Luke Timbrook, Sherwood Fairview; Ron Banks, Lima Central Catholic; Louis Hoersten, Lima Perry; Blake Reynolds, Columbus Grove; Tyler Clum, Harrod Allen East; Caden Hill, Ashland Crestview; Blake Hershberger, Harrod Allen East; Brayden Owens, Lima Perry; Carter Reinhart, Kansas Lakota; Rossy Moore, Lima Central Catholic; Jay Knapke, St. Henry; Myles Blasingame, Coldwater; Jeremey Allen, Lima Central Catholic; Marshall Rose, Findlay Liberty-Benton; Theo Hernandez, Gibsonburg; Mason Commisso, Hicksville; Devares Gleen, Lima Perry; Brevan Moore, Castalia Margaretta; Ross Kuhn, Ashland Crestview; Jakob Backhaus, Mitchell Breckler, Sherwood Fairview; Andrew Imthurn, Defiance Tinora; Braden Langham, Hicksville; Parker Thiel, Hicksville; Nick Beemer, Metamora Evergreen; Grant Baumle, Haviland Wayne Trace; Nick Hawk, Rockford Parkway; Carter Reinhart, Kansas Lakota; Devin Keim, Kansas Lakota; Collin Hipsher, Kansas Lakota; Connor Williams, Carey; Willie Schafer, Carey; Ethan Beringer, Carey; Ian Yeater, Carey; Kane Lynch Attica Seneca East; Skyler Walker, Attica Seneca East; Anthony Williams, Northwood; Austin Cole, Northwood; Demond Marks, Northwood; Sam Bullimore, Northwood; Cayden Schober, Northwood; Tyler Hughes, Northwood; Cam Noel, Northwood; Thomas Foust, Oregon Cardinal Stritch; Ben Dunsmore, Oregon Cardinal Stritch; Hunter Crippen, Oregon Cardinal Stritch; Noah Power, Oregon Cardinal Stritch; Trevor Taylor, Columbus Grove; Ethan Hall, Ada; Riley Schumacher, Columbus Grove; DeAndre Nassar, Bluffton; Mason Ault, Bluffton; Devin Good, Collins Western Reserve; Cody Benesh, Collins Western Reserve; Josh Hess, New London; Chase Clause, New London. Ends– Cole Seslar, Antwerp, 6-2, 184, sr.; Travis Maag, Pandora-Gilboa, 6-0, 200, sr.; Cristiano Murphy, Greenwich South Central, 5-10, 155, sr.; Zach Hayman, Sycamore Mohawk, 5-11, 160, sr. Tight ends- Ivan Berry, Arlington, 6-3, 208, sr.
Linemen- Gage Hovest, Pandora-Gilboa, 5-10, 230, sr.; Riley Spangler, Leipsic, 6-4, 228, jr.; Eli Branham, Edgerton, 6-3, 270, sr.; Sam Meyer, Norwalk St. Paul, 5-11, 185, sr.; Noah Price, Fremont St. Joseph Central Catholic, 6-4, 270, sr.; Rylan Wallace, Lucas, 6-0, 207, sr.; Luke Brickner, Tiffin Calvert, 5-10, 220, sr.
Running back- Hunter Prince, Edgerton, 6-0, 195, jr.; Dominic Ruffing, Monroeville, 5-10, 155, sr.; Jeb Grover, Lucas, 5-10, 193, sr.; Kade Collins, Plymouth, 5-10, sr.; Austin Jones, Tiffin Calvert, 6-2, 195, sr.
Athlete- Tanner Schroeder, McComb, 5-11, 190, sr.
Quarterbacks- Jared Breece, Pandora-Gilboa, 6-2, 180, sr.; Drew Kline, Convoy Crestview, 5-10, 160, sr.
Kicker- Jake Griffin, Norwalk St. Paul, 6-6, 175, sr.
Linemen– Andrew Smith, McComb, 5-10, 175, sr.; Zeb George, Pandora-Gilboa, 6-1, 225, sr.; T.J. Rhamy, Hamler Patrick Henry, 5-9, 175, jr.; Tyler Hartman, Edgerton, 5-6, 175, sr.; Davis Hedrick, Norwalk St. Paul, 6-4, 265, sr.; Alec Scott, Lucas, 6-2, 206, sr.; Cole Zender, Sycamore Mohawk, 5-11, 190, sr.
Linebackers– Brice Markel, McComb, 6-1, 210, sr.; Brody Degryse, Edgerton, 6-2, 185, sr.; Noah Good, Norwalk St. Paul, 5-11, 175, sr.; Kaiden Thomas, Lucas, 5-10, 181, sr.; Ethan Clum, Crestline, 5-11, 180, sr.; Donovan Bickelhaupt, Bascom Hopewell-Loudon, 6-1, 215, sr.; Bryce Kirian, Sycamore Mohawk, 5-10, 200, sr. Defensive backs- Wade Sheets, Convoy Crestview, 6-3, 190, sr.; Tyler Hiegel, Leipsic, 6-3, 189, sr.; Clayton Flegal, Edgerton, 6-3, 180; Gavin Starcher, Norwalk St. Paul, 5-9, 155, sr.; Logan Niswander, Lucas, 6-3, 183, jr.
Punter- Alec Loveridge, Mt. Blanchard Riverdale, 6-3, 175, sr.
Ends- Kolton Holloway, Hamler Patrick Henry, 6-2, 175, Luke Brewer, Antwerp, 5-10, 160, sr.; David Lamoreaux, Greenwich South Central, 6-4, 180, soph. ; Nic Somodi, Tiffin Calvert, 6-1, 180, sr.; Kelby Sapp, Edon, 6-1, 175, jr. Tight ends- Cody Frericks, Minster, 6-6, 195, sr.; Daylin Pees, Dola Hardin Northern, 6-0, 175, jr.
Linemen– Chris Klopp, Sycamore Mohawk, 6-4, 225, sr.; Micah Snyder, Convoy Crestview, 6-0, 225, sr.; Kyle Wasson, McComb, 6-0, 240, jr.; Nate Sheets, Arlington, 6-1, 280, sr.; Garrett Schwiebert, Hamler Patrick Henry, 6-6, 255, jr.; Michal Ritter, Edgerton, 5-11, 220, sr.; Spencer Gerschutz, Hamler Patrick Henry, 6-0, 190, jr.
Running back- Kheaghan Loe, McComb, 5-8, 185, sr.; Will Morrow, Hamler Patrick Henry, 5-11, 200, jr.; Cam Caizzo, Norwalk St. Paul, 5-9, 175, jr.; Alex Schmitmeyer, Minster, 5-11, 180, sr.; Sam Stickley, Bascom Hopewell-Loudon, 5-10, 190, sr.
Quarterbacks– Dylan Schroeder, Leipsic, 6-3, 210, sr.; Keaton Altimus, Antwerp, 6-2, 180, sr.; Evan Legg, Greenwich South Central, 5-10, 160, jr.; Keith Jenkins, Sycamore Mohawk, 6-0, 180, sr.
Kickers- Blake Steiner, Pandora-Gilboa, 6-0, 150, soph. ; Jacob Savina, Antwerp, 5-11, 165, jr.
Linemen– Tyson Speyer, Arlington, 6-5, 204, jr.; Clay Gerdeman, Leipsic, 6-3, 195, sr.; Tyler Sherer, Greenwich South Central, 5-11, 170, sr.; Brandon Heitkamp, New Bremen, 6-2, 201, sr.; Jacob Rindler, New Bremen, 6-2, 204, sr.; Alec Bollinger, Sycamore Mohawk, 5-11, 180, sr.; Robbie Gonzalez, Convoy Crestview, 6-1, 250, sr.
Linebackers– Cole Williamson, Leipsic, 5-11, 193, jr.; Riley Larcom, Pandora-Gilboa, 6-2, 180, 6-2, 180, sr.; Wyatt Caudill, Greenwich South Central, 5-11, 175, sr.; August Boehnlein, Minster, 6-3, 215, sr.; Kedryk Leeth, Sycamore Mohawk, 6-3, 220, sr.; Josh Recker, Tiffin Calvert, 6-1, 210, sr.; Brody Brecht, Convoy Crestview, 5-10, 205, soph. Defensive backs- Bryce Basinger, Pandora-Gilboa, 6-2, 155, soph. ; Braydon Cape, Edgerton, 6-2, 185, sr.; Mike Ketner, Minster, 5-10, 165, sr.; Grant Sepanic, Fremont St. Joseph Central Catholic, 5-6, 145, jr.; Curtis Schwinnen, Delphos St. John’s, 6-1, 175, sr. Honorable mention: Sam Schmiesing, Minster; Blake Coffman, Lucas; Matt McFarland, Fremont St. Joseph Centerl Catholic; Matthew Oehrli, Crestline; Ben Schafer, Monroeville; Chayce Schaub, Monroeville; Adam Rogers, Monroeville; Avery Baldosser, New Washington Buckeye Central; Logan Parrella, Crestline; Elijah Reed, Fremont St. Joseph Central Catholic; Evan O’Rear, Arlington; Tristen Arnold, Lucas; Christian McKinney, Hilltop; Carson Hauger, Lucas; Clay Gerdeman, Leipsic; Tristan Sherick, McComb; Logan Korpics, Cory-Rawson; Austin Niese, Pandora-Gilboa; Gavin Lomeli, Leipsic; Peyton Traxler, Pandora-Gilboa; Robert O’Dell, McComb; Jaret Nelson, Hopewell-Loudon; Owen Wetherill, (Dola) Hardin Northern; Tommy Stauffer, Cory-Rawson; Eli Franks, McComb; Gage Murphy, Riverdale; Tyler Durfey, McComb; Jaret Vermillion, Arlington; Isaiah LaTurner, Convoy Crestview; Kyle Searson, Waynesfield-Goshen; Cam Gebers, Hamler Patrick Henry; Braden Petersen, Hamler Patrick Henry; Logan Showalter, Edgerton; Tyler Eustace, Edgerton; Trevor Eustace, Edgerton; Brett Fulk-Antwerp; Tycen Cooper, Greenwich South Central; Everett Samstag, Sandusky St. Mary Central Catholic; Nick Patchen, Sandusky St. Mary Central Catholic; Will Roth, Sandusky St. Mary Central Catholic; Lewis Fabrizio, Tiffin Calvert; Vinny Volpe, Tiffin Calvert; Jake Seifert, Tiffin Calvert; Nick Krajewski, Tiffin Calvert; Aaron Rombach, Tiffin Calvert; Collin Cordell, Sycamore Mohawk; Kobe Stillberger, Sycamore Mohawk; Jared Lindke, Toledo Christian; Antonio Leake, Toledo Christian; Joseph Delvaux, Toledo Christian; Jack Militello, Fremont St. Joseph; Caleb Reed, Fremont St. Joseph; Austin Kiess, Edon; A.J. Healy, Hamler Parrick Henry; Cole Reiman, Leipsic.